Allergen Statements / Claims No Sugar, No Starch, No Artificial Flavors, No Wheat, Gluten Free, No Corn, No Dairy. Other Ingredients Dicalcium Phosphate, Microcrystalline Cellulose, Hydroxypropylcellulose, Vegetable Stearate, Hydroxypropyl Methylcellulose, Enteric Coating (Stearic Acid, Sodium Alginate, Ammonium Hydroxide, Ethylcellulose, Medium Chain Triglycerides, Oleic Acid) Croscarmellose Sodium, Silicon Dioxide, Calcium Silicate, Titanium Dioxide (Mineral whitener), Magnesium Stearate Vegetable Source, Vegetable Acetoglycerides, Natural Mint Flavor, Sucralose, Triacetin, Diacetylated Monoglycerides. Serving Directions As a dietary supplement, take two tablets daily. Studies have shown that taking creatine is beneficial before, during or after exercise. 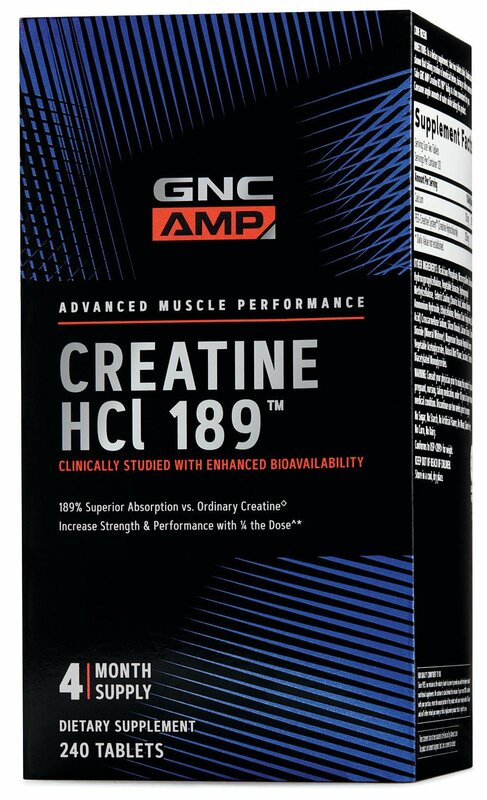 Take GNC AMP Creatine HCI 189™ daily at a time convenient for you. Consume ample amounts of water while taking this product. Precautions WARNING: Consult your physician prior to using this product if you are pregnant, nursing, taking medication, under 18 years of age or have a medical condition. Discontinue use two weeks prior to surgery.